Radio/Tech 14B contains all the known modifications for Alinco, Yaesu, Standard, ADI (Premier), AZDEN, K D K , TEN TEC, RANGER, UNIDEN, RADIO SHACK, RCI, HEATHKIT Amateur radios. The Radio/Tech Modification books are indispensable tools for radio repair technicians and amateur radio hobbyists who are serious about enhancing radio transceivers and scanners. Modifications are presented that increase the radio's frequency transmit and reception coverage. Many of the modifications will allow a radio or scanner to monitor cellular phone calls. Click on the Manufacture below to see a description of the radio and modifications provided. The two volume set contains modification information for all popular handy-talkies, mobile, and base stations. Modifications for a wide variety of scanners and CB radios are also there in concise, easy to follow, instructions. Additionally, alignment controls for many of the radios are presented in graphic line drawings. The Radio/Tech Modification Books are updated yearly to include the latest and greatest radios. The timely and accurate information they contain makes it easy for most people to expand their frequency coverage. Each book covers specific brands of radios so you can choose the book you need, or get both so that your library contains powerful information that you, your customers, and your friends can use as needed. 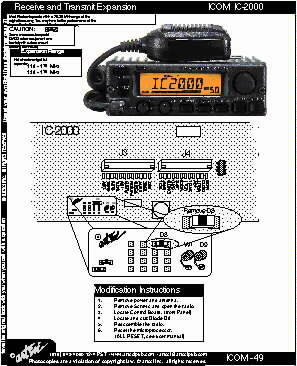 The Radio/Tech Modification Book Edition ##A contains information for ICOM, Kenwood, and a wide variety of scanners. The Radio Tech Mod Book Edition ## B contains Alinco, Standard, Yeasu, CB, and other radio modification information. Radio/Tech Modifications sell for $19.95 each. copyright ©1996,2019 artsci publishing. all right reserved.